Your telephone is running low on power while you wait to fly out of an airport. Other people have connected their cell phones and other devices to electrical outlets in the waiting area. Like you, they are preparing for the flight. Then you discover a public USB charging area close by. You quickly reach for a charge cord and connect your phone to the charging hub. Then you take a deep breath and sit back, happy to get the power for free. In addition to providing electrical current, phone charge cords can send and receive data. That free USB charging hub at an airport, hotel or other public place may not only charge your phone. It also could be transferring information to and from the device. The USB charging hub could be connecting to your phone and copy your contact list, email and text messages, voice mails, photographs and videos. It can also copy passwords, banking information, personal contacts and any other information stored on your phone. That public USB hub may even download programs, such as malware and tracking software, to your phone. This form of data transfer is known as "juice jacking." 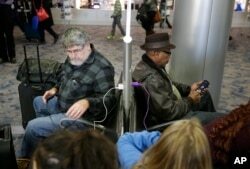 In this Dec. 29, 2014, photo, people use a charging station at McCarran International Airport in Las Vegas. If you want to charge your phone while traveling, you have other choices that do not increase your risks. Connect your phone only to electrical outlets so data transfer is not possible. An available outlet may not be as near as a USB charging hub, but the few extra steps may keep you safe. It is better to use a distant wall outlet than a nearby USB charging hub. Carry a cord that only transfers electricity, not data. Be sure to mark the cord so you do not accidentally use it when you need to transfer data, such as saving photos to your computer. Carry an extra, fully-charged battery. Having one means you can charge your phone without having to worry about carrying a special cord or finding a power outlet. You can charge your phone with the extra battery wherever you are, even when you are far away from an outlet. If you must use a public USB charging center, make sure to turn off your phone completely. This may or may not prevent data transfer. But it will reduce the chances of it happening, depending on what phone you have. Remember to fully charge your phone before you leave home or work. iOS and Android operating systems have security programs designed to prevent juice jacking. But the safest way to charge your phone is to avoid public USB hubs. A few years ago, a computer security conference was held in Las Vegas, Nevada. One security company set up USB charging areas that had video screens. The screens showed the message: Free Cell Phone Charging. Brian Markus is chief executive officer for Aires Security, which set up the USB hubs. He explained that the purpose was to show how even security experts could be persuaded to charge their phones at such centers. FILE - Migrants charge their mobile phones at the border station between Serbia and Hungary near Horgos, Serbia, Wednesday, Sept. 16, 2015. Naturally, not every USB charging hub is operated by those who are trying to take data from your phone or download malware onto it. Many charging stations just do what they say, charge your phone for free and do not do juice jacking. But you should know that you are taking a risk when you connect to a public USB charging hub. Better to be safe and charge from an electrical outlet rather than a USB port. Have you heard of juice jacking? Did you realize that USB charging stations could transfer data as well as electricity? Have you used USB charging stations while traveling? What steps do you take to protect data on your phone and tablet?